Kurt Stenzel - "Cookin' With Kurt"
Beyond-o-matic's Stenzo, the man who indulges ALL his musical interests, has released a 30 minute instrumental journey into trippy Krautrock-land that will surely please fans of exploratory spacerock. 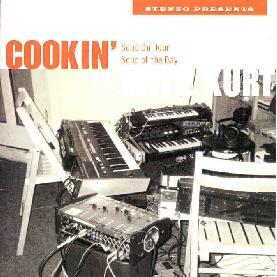 The two tracks on "Cookin' With Kurt" were improvised in the studio with Kurt on synths, Beyondo bandmate Peter Fuhry on flute and clarinet, Charles Davis on bass, and Randy Burke on drums. Davis and Burke are a capable rhythm section, the duo taking responsibility for keeping the pace and tempo controlled throughout, thereby assuring that the Stenzo/Fuhry ventures are kept on a path that has some semblance of direction. They also give a good groove to the music, and Burke's drumming is very much in the forefront throughout. Fuhry's flute is a gorgeously trippy lead instrument (clarinet on track 2) giving the music a cosmically jazzy feel. And Stenzo takes the whole thing into orbit as he moves through a variety of gear including Korg, Roland, Moogs, Casio, and other electronic toys. I really like the way the flute and drums are made prominent, while Stenzo's synths are mixed just a wee bit behind them so that they're critical to the whole but not overpowering. Fans of Amon Düül II and too many other Krautrock bands to mention will love these tunes. They aren't the next best thing. Just, as Stenzo says in the liner notes, "No big statement, no band, no scene, no context, just incidental music for around the house". Yeah man, I was vacuuming and doing the dishes and everything! My wife wants me to listen to Cookin' With Kurt ALL the time! (Gosh, I had a silly moment there.) Anyway, please note that this is only one small part of a much larger world, and I would urge you to check out the Beyond-o-matic article and interview with Stenzo we did in AI #6 for further enlightenment. CLICK HERE to read it. You can email Kurt Stenzel at kurts@tts-sf.com. To check out Beyond-o-matic and other related bands you can visit the Jamaelot Records web site.